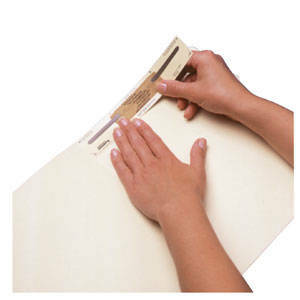 Self-adhesive sup'r'grip fasteners are an ideal space-saving solution for large files. Long 2" prongs accommodate 2-hole punched material, while the ultra-thin design saves valuable filing space. Fasteners are heat bonded onto pressure-sensitive, 60 lb. manila-colored paper to hold even the bulkiest files without tearing. Printed aligning guides on each strip ensure accurate placement. 4 fasteners per sheet; 25 sheets per box.